1. 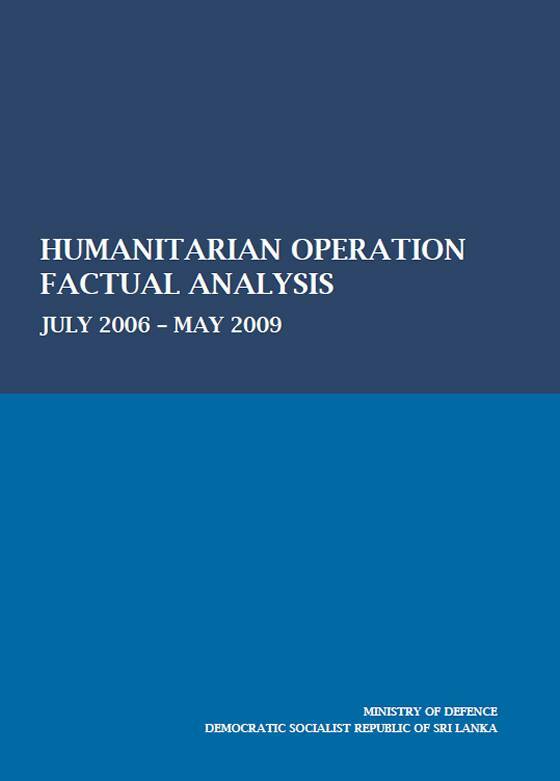 This report sets forth the factual background and operational context of the Humanitarian Operation undertaken by the Government of Sri Lanka between July 2006 and May 2009 to free the country from the Liberation Tigers of Tamil Eelam (LTTE). An examination of these facts demonstrates why the Government of Sri Lanka engaged in a military strategy against the LTTE, why Security Forces used the level of force they did, and how at each stage in the operation Sri Lanka took extraordinary steps to respect and protect the lives of civilians. 2. Part One of this report provides a detailed background of the LTTE, including its historical record of atrocities, its scale and sophistication, and its repeated rejection of options for a peaceful solution. At the end of Part One, it is clear why the Government of Sri Lanka had no resort but to pursue a military strategy against the LTTE. 3. Part Two explores the rationale for Security Forces using the degree of force and types of tactics they used, and demonstrates how all aspects of the Humanitarian Operation were planned and executed in light of deep concern for the lives of all Sri Lankan citizens. This section details the steps taken to minimise civilian casualties, including an examination of pre-operation training and policies and specific tactics used in the battles in the East and the Wanni. 4. Part Three concludes the report with an overview of the consequences of the war and shows why the Humanitarian Operation was just—both in the way it was conducted and in its result. 5. For three decades, the LTTE unleashed a brutal campaign of terror and violence in Sri Lanka that resulted in the deaths of tens of thousands of Sri Lankans of all ethnicities. Using a combination of terrorist tactics and conventional forces, the LTTE carried out massacres of innocent civilians, attacked economic targets and vital infrastructure and created a fear psychosis that crippled everyday life for several generations of Sri Lankans. The LTTE also assassinated over one hundred democratically elected political leaders and government officials from all ethnicities in Sri Lanka as well as the head of state of Sri Lanka and a former Prime Minister of India. 6. In addition, the LTTE ceaselessly threatened and subjugated the civilians living in the North and East, particularly in the areas it dominated, recruiting young children as combatants, laying mines in civilian areas, engaging in ethnic cleansing campaigns and denying the people basic human rights and democratic freedoms. People in all parts of Sri Lanka were terrorised by the LTTE and forced to endure a state of unending fear and insecurity. 7. The LTTE has been recognised as one of the most ruthless and sophisticated terrorist organisations in the world. Its use of terrorist, guerrilla and conventional tactics through its semi conventional fighting force, coupled with access to hundreds of millions of dollars from criminal activities, voluntary contributions and the extortion of individuals throughout the world, made the LTTE a formidable foe that repeatedly eluded military defeat. 8. Throughout the protracted armed conflict with the LTTE, the Government of Sri Lanka repeatedly tried to engage the LTTE in peace talks with the goal of reaching a peaceful negotiated settlement. In two instances foreign governments also assisted in this effort: in 1987, the Governments of India and Sri Lanka signed the Indo-Lanka Accord, which led to the presence of an Indian Peace Keeping Force (IPKF) in Sri Lanka for two years, and in 2002, a peace process was facilitated by Norway. During each attempt for a negotiated settlement, the LTTE rebuffed the opportunity for peace and used the cessation of hostilities during talks to regroup, rearm and strengthen its military capabilities. 9. During the ceasefire that accompanied the last peace process, the LTTE closed a vital sluice gate at Mavil Aru in July 2006, posing a dire threat to civilians of all ethnicities in the Trincomalee District. This was immediately followed by a well-planned attack by the LTTE on several fronts to take possession of the strategic Trincomalee Harbour and the surrounding areas. Given the immediate threat to civilian lives, the history of atrocities inflicted on its people, and the LTTE’s repeated violations of the ceasefire agreement, Sri Lanka had no resort but to launch a Humanitarian Operation to liberate the people of the East and North from LTTE control and free all Sri Lankans from the LTTE’s terror. 10. As this Humanitarian Operation progressed in Sri Lanka’s favour, an increasingly isolated LTTE leadership surrounded itself with a human shield of thousands of civilians in a brutal attempt at self-preservation. The LTTE forcibly detained these civilians and kept them hostage through violent means, and deliberately endangered their lives by blurring the distinction between combatants and civilians, and by using protected civilian sites for military activity. 11. Acutely aware of the atrocities committed by the LTTE, its scale and sophistication, and the clear and present danger to thousands of civilians trapped by the LTTE, the Government of Sri Lanka had a responsibility and a duty to defeat the LTTE and liberate the civilians trapped in its clutches. Security Forces acted with the force necessary to accomplish this task and proportionate to the threat they faced. 12. The Government of Sri Lanka made every effort to protect civilians in the conflict zone through the creation of Safe Corridors and No Fire Zones, and by adhering to a “Zero Civilian casualty” policy that had been conveyed to all troops through repeated training and operational orders. Sri Lanka also took a proactive and extensive role in delivering humanitarian assistance to these civilians before, during and after the fighting. Despite the clear intent of the Government of Sri Lanka and the numerous precautions taken, it was impossible in a battle of this magnitude, against a ruthless opponent actively endangering civilians, for civilian casualties to be avoided. 13. On 18 May 2009, Sri Lanka defeated the LTTE, bringing to an end three decades of conflict and suffering. The Government of Sri Lanka provided immediate humanitarian assistance to the civilians who had been trapped by the LTTE and acted expeditiously to resettle internally displaced persons in their original villages. 14. Today, Sri Lankans of all ethnicities, living in all parts of Sri Lanka, are free from LTTE terror and no longer live in a state of fear. Democracy is restored in the North and the East, the electoral process has been resuscitated after decades, internally displaced persons have been resettled in their homes, infrastructure is being restored, the economy has been revived, former armed groups have been disarmed and have joined the political process, child soldiers conscripted by the LTTE are back with their families, and other cadres who surrendered are being reintegrated into civilian life after rehabilitation. Sri Lankans have begun the process of rebuilding their lives and their country.